So, up with an early alarm on Monday morning, I’ve taken a new look at this IQ. I chose a new photo, and played around with the fonts some more. I feel glad knowing I’m actually truly happy sending out this image; few things sting more than compromising and publishing sub-standard work. 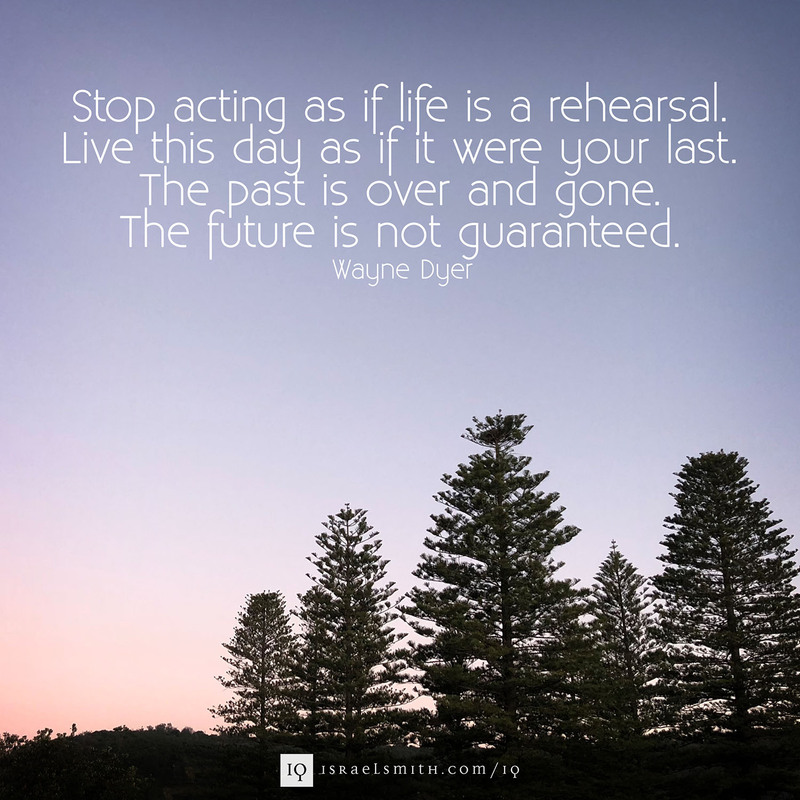 I was immediately drawn to this quote by Wayne Dyer, as it sums up a big part of my philosophy about living: We don’t get a second chance at this thing called life – religious beliefs notwithstanding – so we might as well make it the best we can. In fact, whether we come back for more lives as humans or not, I believe the whole point of our lived human existence is to make it the best we can. To love, to live as fully as possible, to express our inner gifts, to experience the gamut of the human experience, and to find some kind of acceptance or contentment. Bearing this in mind, it’s important to be clear on our values, so we can appropriately choose how we invest our most precious resource: time. Unless we know what we value, we will fritter away our seconds and live someone else’s life. What do you value? What makes you joyful? This quote, to me, is about that notion that how we spend our days is how we spend our life. But further, it reminds us to not live looking backwards (the past) or with our heads too focussed on what is yet to come (the future). In a way, this quote is reminding us to be present in this very moment, where life actually happens. I like that final sentence. In fact, I like the whole quote and concept. It’s fascinating to me, and it feels accurate, at least as far as my own experience is concerned. So much of the work I’ve done on my own depression and anxiety is about reminding myself to be mindful, to be present, and to remember that in this very moment, I am safe, I am healthy, and I have everything I need. I also find it fascinating that there are so many ways to state the exact same thing; as though we each need to hear these messages in a different way now and then, to remind us of the universal truth behind them. Living is done in the present. In it, we find inner contentment, we experience joy, we feel the warmth of gratitude, we know deep love. These things – contentment, joy, gratitude, love – are the treasures for which we spend so much of our lives searching. Yet if we simply pause, and be present, we will realise that we already have these treasures in our possession. We had them all along, inside ourselves, in the present moment.